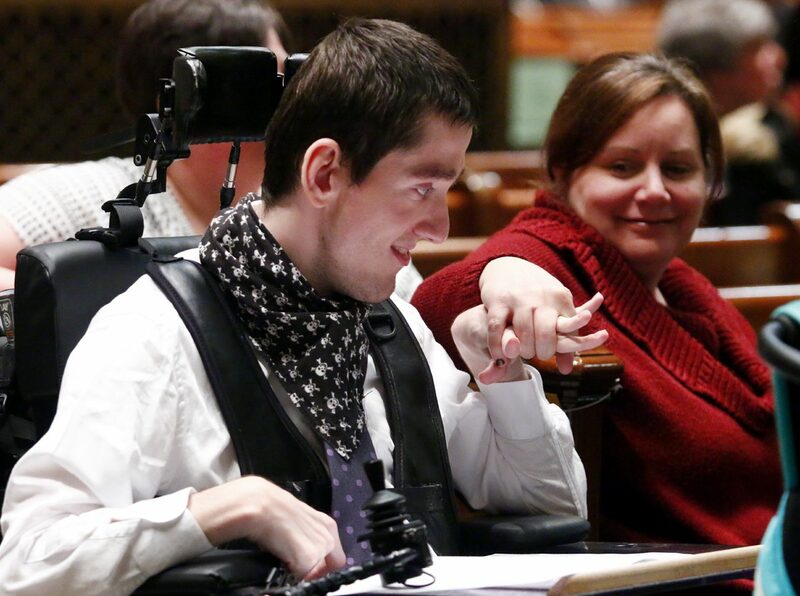 The Archdiocese of Philadelphia’s annual Mass honoring the gifts of persons with disabilities, the deaf community, along with family, friends and caregivers, held on Saturday morning April 1, was the fifth time for Archbishop Charles Chaput as celebrant and homilist. Looking out at the multitude of wheelchairs, pews filled with the blind, the hearing impaired and those with mental disabilities, all accompanied by loving families and caregivers, his point was well taken. “There is nothing about pretense, what is present here is humanity, beautiful in its own unique way, a community with loving support of one another,” the archbishop said. Assisting especially with the men, women and children in wheelchairs was a group of students from nearby Roman Catholic High School, shepherded by Ed Keenan, class of 1954, who also oversees a program at Roman for visitation of aged shut-in alumni. One of the concelebrants was Msgr. Richard Bolger, who was first sensitized to persons with disabilities though his own sister, who had Down syndrome. Many of the congregants with disabilities were coming from various schools and residences for the disabled, but not all. Carol and Rob Cardie of St. Francis of Assisi Parish, Springfield, were there with their two beautiful little adopted children, Tommy and Theresa, both with vision impairment caused by albinism. They were also there because their daughter Sarah, who does not have a disability, was one of the sign language interpreters for the Mass. Sister Kathleen, who is director of the Office for Persons with Disabilities and the Deaf Apostolate, will be heading to Rome in October as one of the collaborators for a conference and convocation on catechesis for persons with disabilities and their engagement. The event will be part of the upcoming 25th anniversary of the official promulgation of the Catechism of the Catholic Church. Through its many social services and the annual Mass, the Archdiocese of Philadelphia has been doing this for many, many years. Great. We must remember to honor Father Anthony Russo who worked with the hearing impaired for years.